Hey! I keep expecting hotels to let me use their Wifi for free, and I’m consistently disappointed. So I’m writing this one up quick at a Starbucks in NYC. Luckily I’d already collected photos. Here are a few more Halloween treats that J planned for her party. 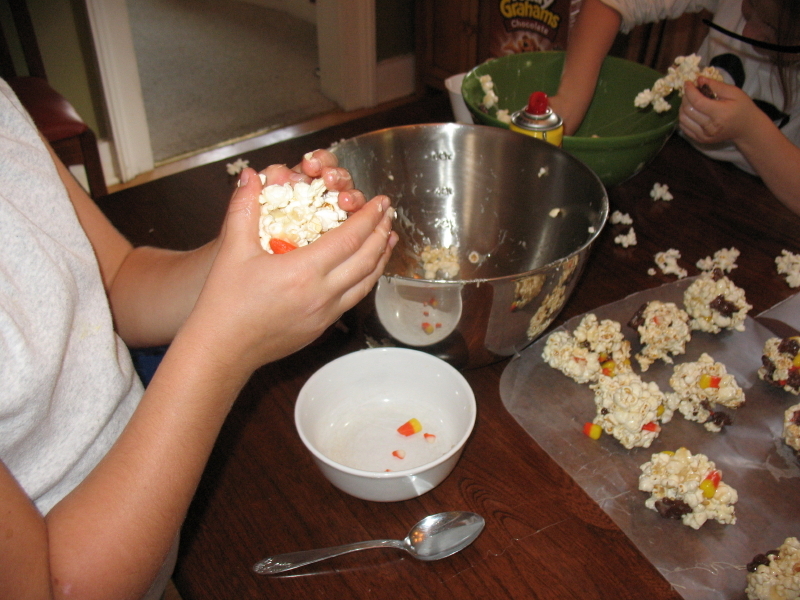 First, some popcorn balls from our Southern Living Kids Cookbook. 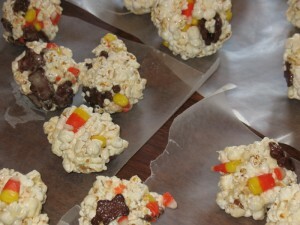 Basically, it was your standard popcorn balls, to make it more festive, the cookbook suggests chocolate Teddy Grahams and candy corn. Yummy. These were marshmallow-y, so they were sticky and messy. For another sticky, messy option, you could go with caramel (here’s a recipe I’ve shared before). Because I’m insane, I managed to leave this job ’til one of the last things before the party started. About 12 minutes before start time, all four of us had marshmallow hands, and my mother phoned us. She got the machine. Two minutes later we had, maybe 3 clean hands between all of us and the doorbell rang with our first guest. Phew! But they’re cute, right? 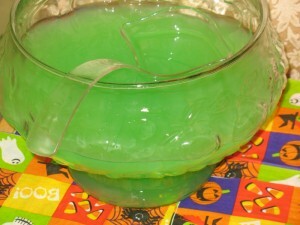 Of course we had the punch bowl, but J had an idea to make the lemonade more Halloween-y. That’s right! We dyed it green with some food coloring! And finally, we went with chocolate cupcakes and chocolate frosting with spider webs. 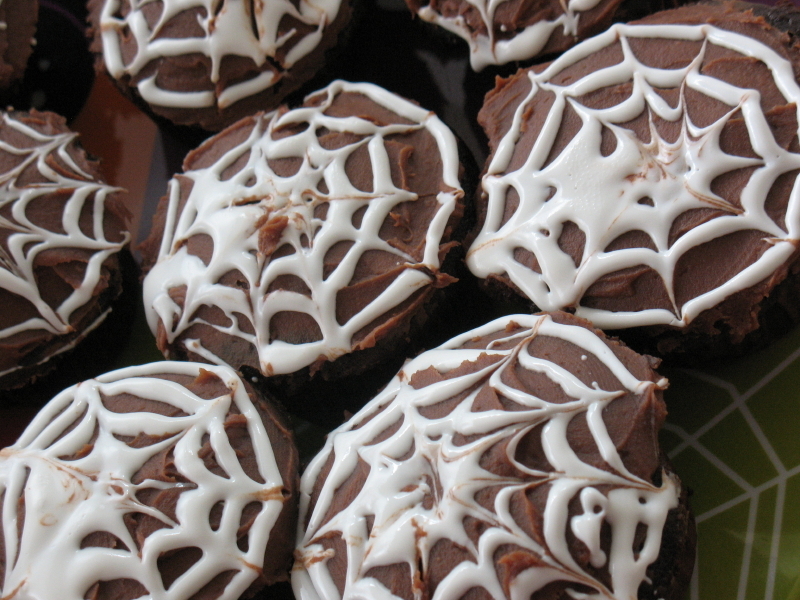 This turned out to be our easiest treat-just make circles with white decorator frosting and drag toothpicks from the center out. They loved doing this, and it was yummier than those crazy eyeballs. 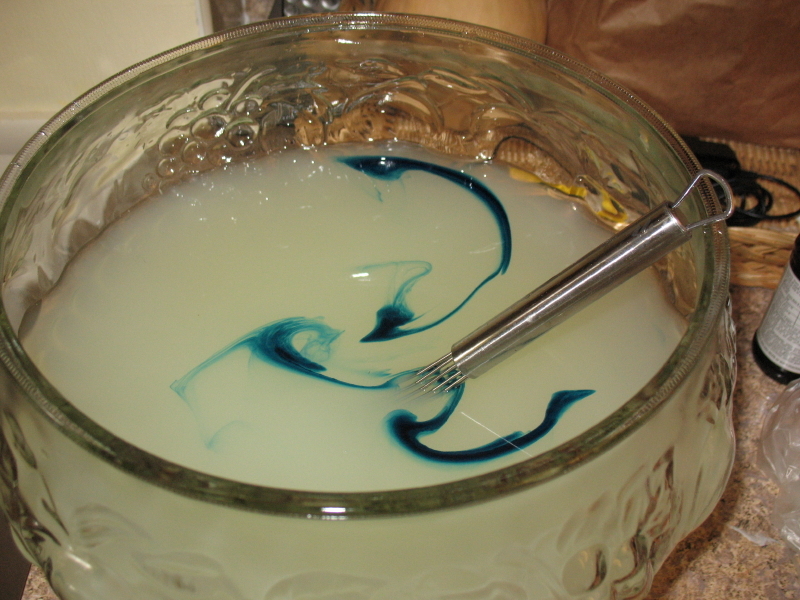 There are recipe variations of like this all over the place.